AmeriCorps Spotlight: Choice East - CARITAS - Shelter. Jobs. Recovery. Hope. 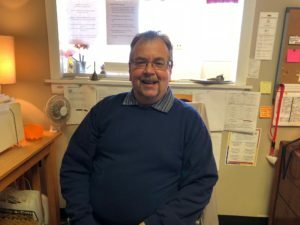 What that means: I work alongside the program manager, Sandy Morris, processing client referrals so that they are able to utilize our furniture bank. I work with several community partners, such as case workers and their clients to schedule appointments and coordinate with the warehouse to deliver items. I’m the first point of contact for the public when they are inquiring about services provided at CARITAS. Background: I grew up in Newport News, Virginia, spending a lot of time in Norfolk as well. I moved to San Francisco where I stayed for 15 years enjoying all the bay area had to offer. After experiencing some tough times I moved back to Virginia with my family. In December 2015 I entered The Healing Place, where I became familiar with CARITAS and its four programs and completed the Works program, class of 46. Upon completion of Works I began working as an AmeriCorps Warehouse Driver. Hobbies & Interests: In my spare time I love to cook and try new recipes adding my own special flair to each dish.I also enjoy shopping and have found my newest obsession- online shopping! When at home, I enjoy watching old movies and listening to my favorite singer Shirley Bassey. I Most Want To Visit: I have always wanted to go to Greece to visit the ancient ruins and see the beautiful islands with blue water and white sand and buildings. Favorite Place I’ve Lived: I loved living in San Francisco because it was off the chain! It was entirely another world, not like anywhere else! I Can’t Live Without: My sense of humor because it has gotten me through some dark, tough times, and it gets me through my daily life.